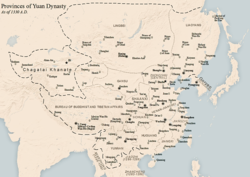 The Yuan dynasty was a Mongol dynasty that ruled Mongolia and China from 1271 to 1368. Before this dynasty, China was ruled by the Song dynasty. After the Yuan dynasty, the Ming dynasty ruled China. Genghis Khan and his army of Mongols conquered many parts of China. His grandson Kublai Khan added more parts of China to his kingdom. He founded the Yuan dynasty in 1271. In the year of 1206, Genghis Khan ruled the Mobi tribes(a part of a country) to establish the Mongol country at the Onon River. Jin was the main race in Mongolia, but Jin and Xia were in decline, Mongolia had attacked the Western Xia and Jin in August 1227, and Jin lost, so Mongolia occupied the whole north of China in March 1234. In 1259, Möngke Khan died after the Song Yuan dynasty war. His brothers all wanted to be king. His fourth brother, Kublai, and his seventh brother, Ali Khan, fought to rule the Mobi tribes. And finally in 1264, Kublai won. Kublai made the name "DaYuan" in 1271 and proclaimed the Yuan Dynasty and said its founder was his grandfather Genghis. In 1276, Yuan ruled southern of Song, so yuan ruled the whole China in this year. In 1279, the Kublai subdued southern Song dynasty. The Yuan dynasty ruled China and brought different parts of China together that had been split since the late Tang dynasty. For centuries, most of what the West knew about China came from the book by Marco Polo about his visit to Kublai's empire. The Yuan dynasty ended in 1368 when the Ming dynasty took control. ↑ Tan Qixiang. "vol. 7". The Historical Atlas of China. SinoMaps Press. ISBN 9787503118449. ↑ Rein Taagepera (September 1997). "Expansion and Contraction Patterns of Large Polities: Context for Russia". International Studies Quarterly 41 (3): 499. doi:10.1111/0020-8833.00053. ↑ Wu, Annie (May 13, 2015). "The Yuan Dynasty". China Highlights. This page was last changed on 15 June 2018, at 23:06.